Kadalai Paruppu (Chana dal) Payasam is prepared with chana dal, jaggery, coconut and cashew nuts. 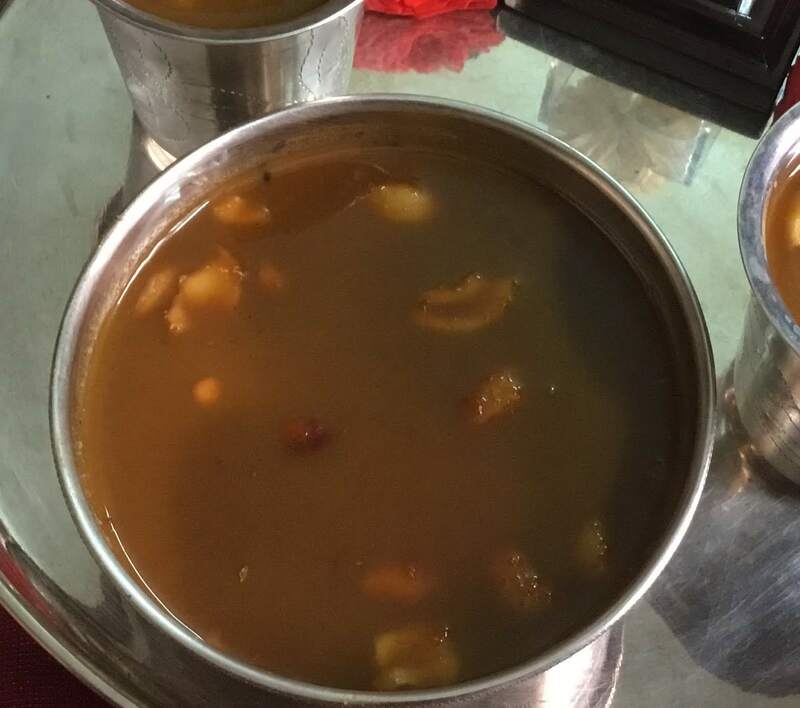 There are several jaggery based payasam dishes in Tamil Nadu. Moong dal payasam, chana dal payasam, rice payasam are the most popular payasam dishes. I learnt this payasam from my Chithi. All the ingredients are handy and you can prepare this delicious payasam within 20 minutes. We will see some important tips for this payasam. Cooking the chana dal correctly is the most important step in this dish. You have to dry roast the chana dal in a pan for a few minutes and then pressure cook for 3 to 5 whistles. 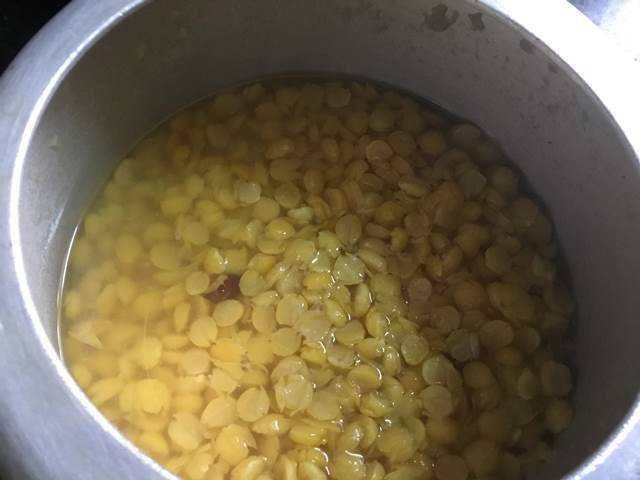 Do not overcook the chana dal then the payasam turns thick. 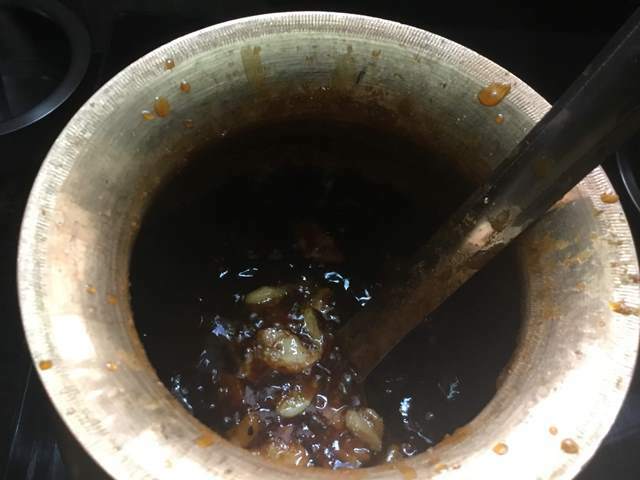 After cooking the dals, you have to gently mash the dal and then add it to the jaggery syrup. 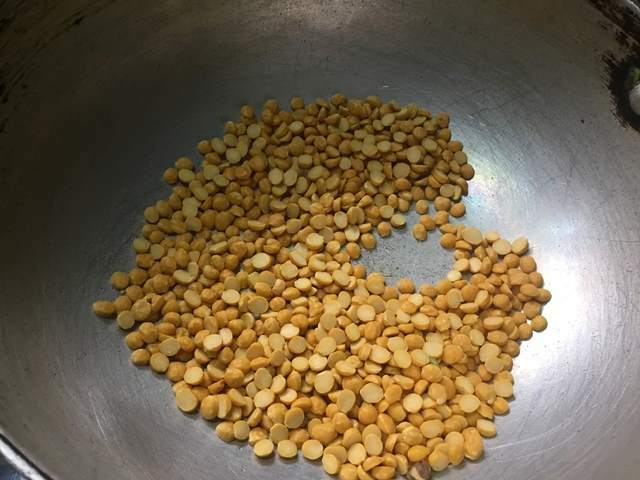 If the chana dal is not properly cooked, then the dals won't blend with the jaggery and the coconut paste. I recommend fresh grated coconut for grinding the paste. 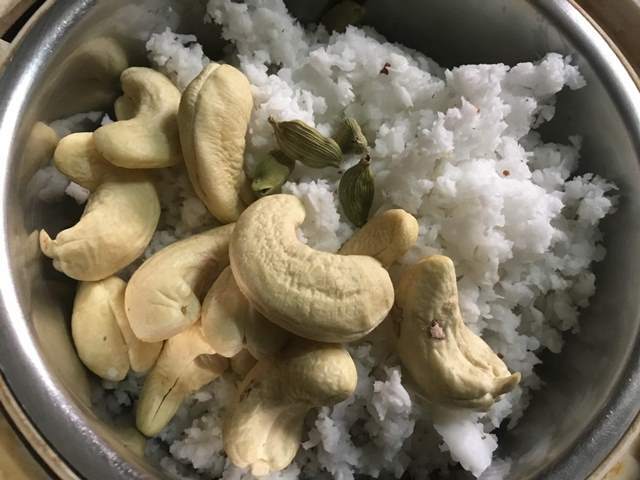 The grated coconut is ground along with cashew nuts add a rich taste for the payasam. You have to grind it nicely without any solid pieces. 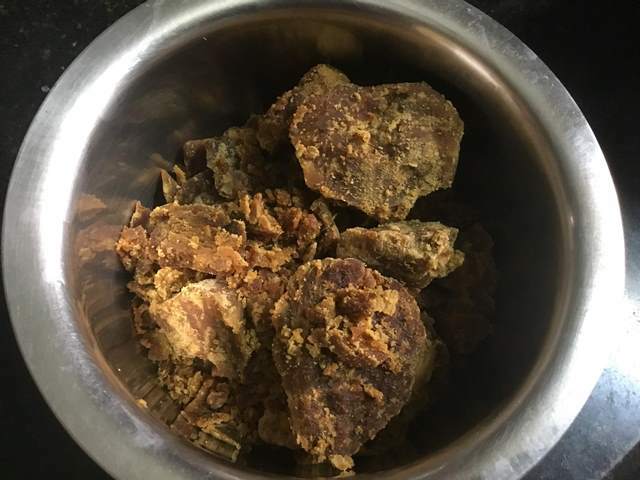 For jaggery based payasams, I prefer 2 to 2.5 cups of jaggery for 1 cup of the main ingredient. Please do not reduce the quantity, because you won't achieve the perfect taste and the colour in the payasam. As I said earlier in my previous posts, try to use pagu vellam. 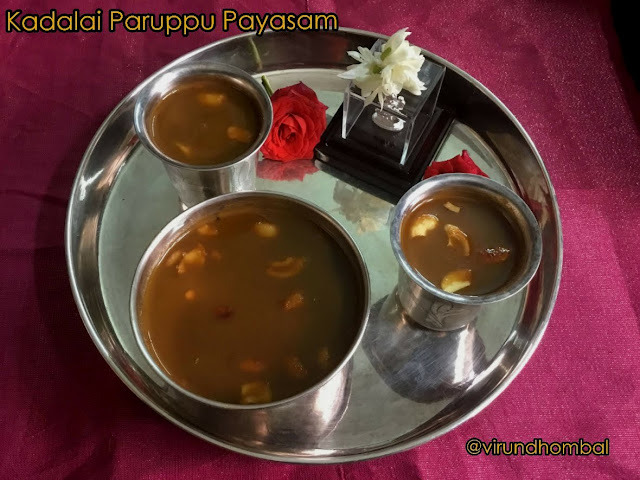 In this payasam I have used black jaggery (Kottayam vellam). It's not palm jaggery . For this payasam, I like to add milk. You have to add the milk, when the payasam turns warm. 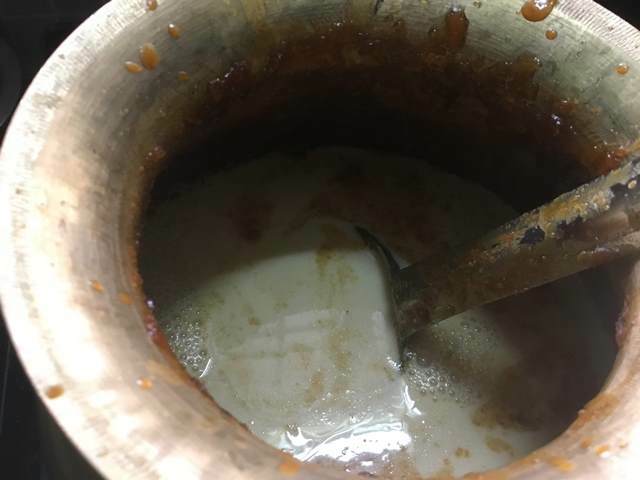 Do not add the hot milk or do not add the milk to the hot payasam because it tends to curdle. No need to add full fat cream milk as it reduces the sweetness in the payasam. Heat a pan for about two minutes and add the chana dal. Roast the chana dal for 3 minutes, until you can smell a mild aroma. 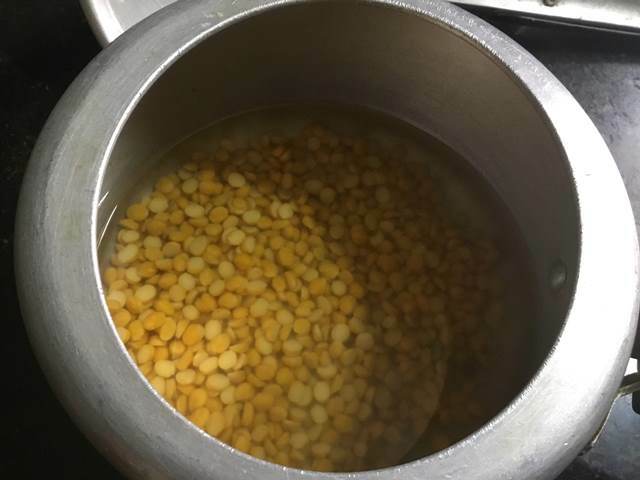 Take a small pressure cooker and add the roasted chana dal and add 1 cup of water. Let the dal to soak for 15 minutes and then pressure cook for 3 to 5 whistles. Add the grated coconut, whole cashew nuts and cardamom in a small chutney jar. Add 3 tbsp water and grind it to a smooth paste. 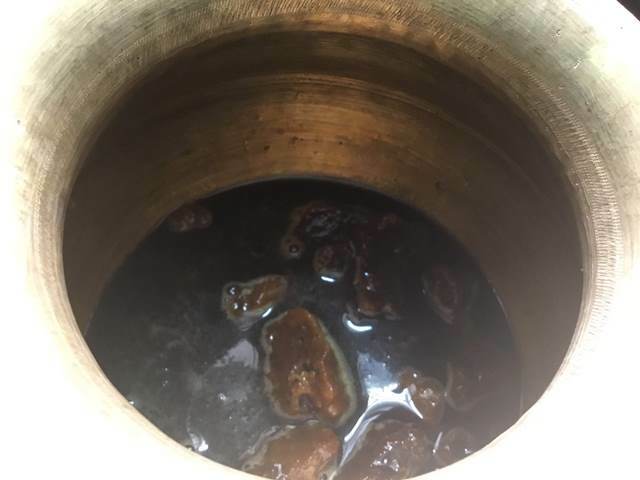 Take a bronze pot or heavy bottomed kadai and add the grated jaggery. Add 1/2 cup of water and allow the jaggery to boil. Open the cooker and gently mash the dal with a ladle. When the jaggery has melted completely, reduce the heat to low and add the cooked dal. Mix them well. After 2 minutes, add the ground coconut cashew nuts paste to the jaggery syrup. Add 2 to 3 tbsp of ghee and cook the payasam on low heat for 10 to 15 minutes. The coconut paste will blend beautifully with the chana dal and the jaggery. 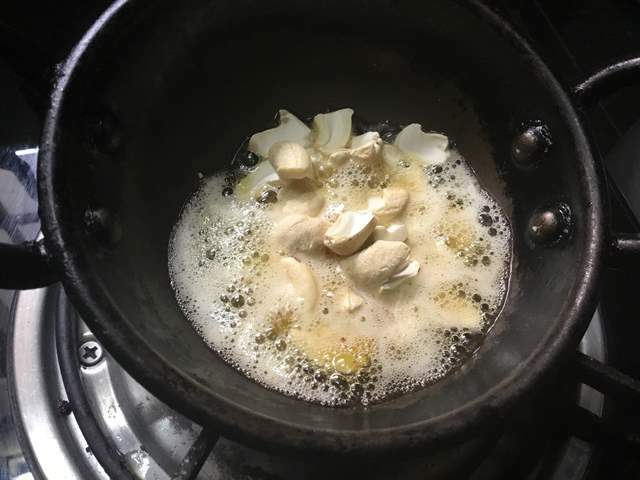 Heat a tbsp of ghee in a small frying pan and add the broken cashew nuts. When it turns golden brown in colour, add it to the hot payasam. Mix them well and turn off the heat. Allow the payasam to cool down naturally for 10 to 15 minutes. After 10 minutes, add the milk to the payasam and mix them gently with the thick payasam. Transfer the payasam to the serving dish. Heat a pan for about two minutes and add the chana dal. Roast the chana dal for 3 minutes, until you can smell a mild aroma. No need to brown them. Turn off the heat and allow it to cool down. Take a small pressure cooker and add the roasted chana dal and add 1 cup of water. Let the dal to soak for 15 minutes and then pressure cook for 3 to 5 whistles. Allow the pressure to settle down naturally. Open the cooker and gently mash the dal with a ladle. No need to mash them nicely. 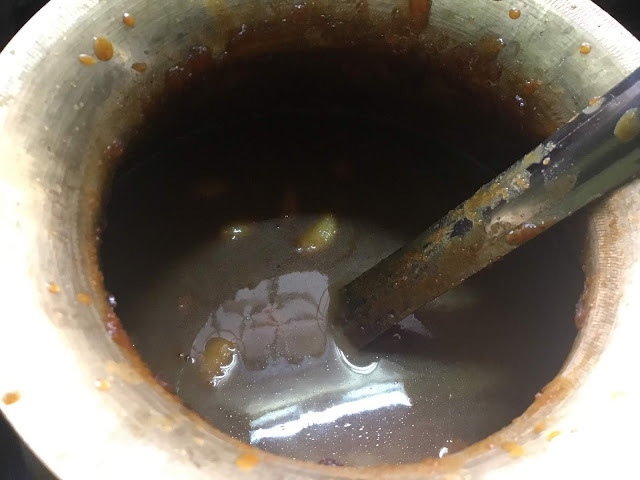 When the jaggery has melted completely, reduce the heat to low and add the cooked dal. Mix them well. After 2 minutes, add the ground coconut cashew nuts paste to the jaggery syrup. 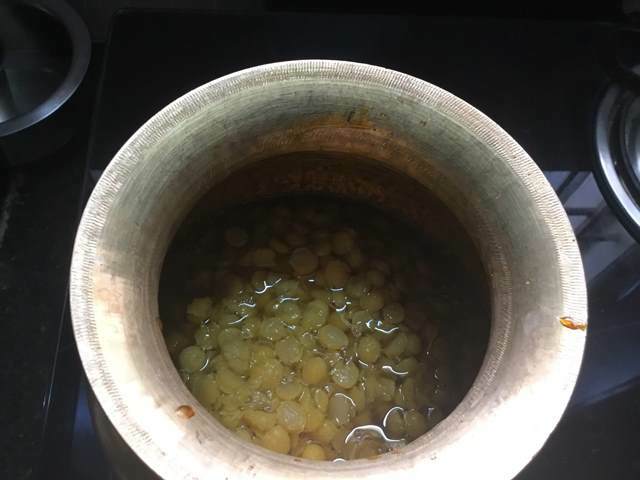 Add 2 to 3 tbsp of ghee and cook the payasam on low heat for 10 to 15 minutes. 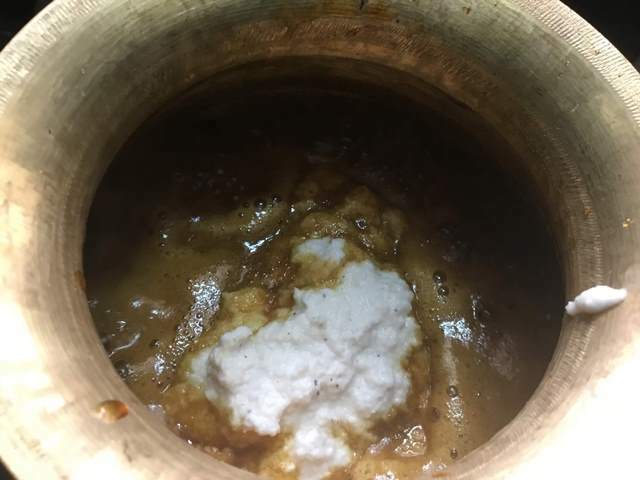 The coconut paste will blend beautifully with the chana dal and the jaggery. 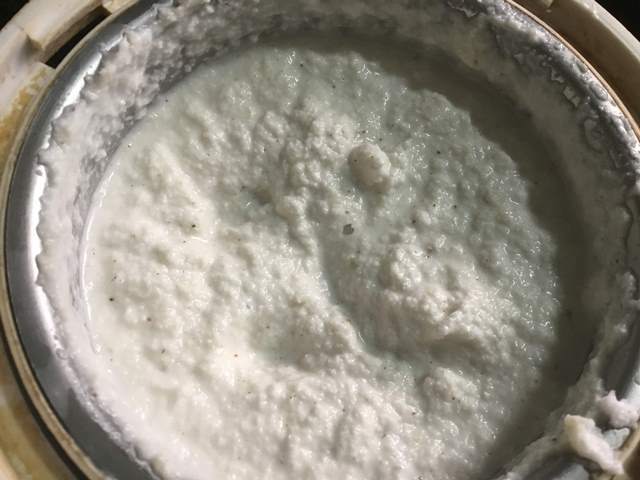 You will see a thick payasam as in the picture below. Heat a tbsp of ghee in a small frying pan and add the broken cashew nuts. When it turns golden brown in colour, add it to the hot payasam. Mix them well and turn off the heat. 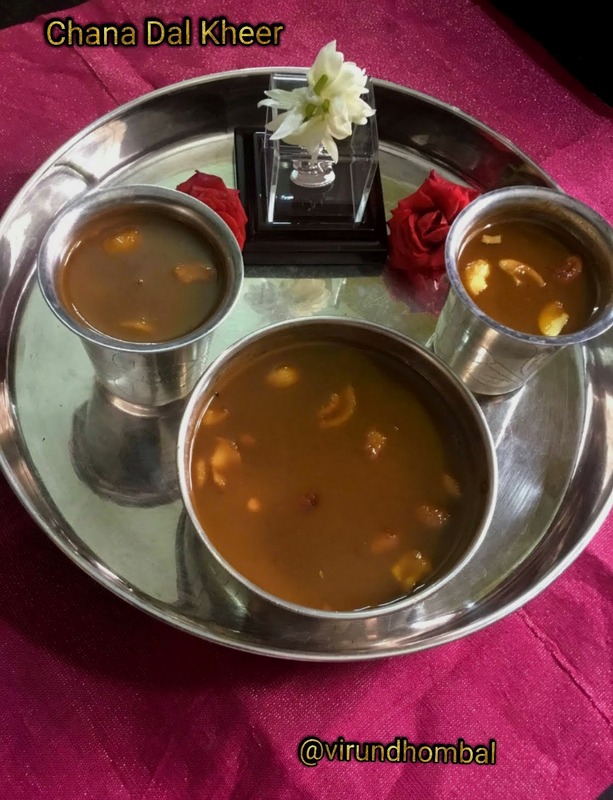 Allow the payasam to cool down naturally for 10 to 15 minutes. After 10 minutes, add the milk to the payasam and mix them gently with the thick payasam. Transfer the payasam to the serving dish and enjoy the payasam with your family for your weekend lunch as a healthy and yummy dessert.